Big Wood Riverfront Luxury Vacation Rental in Ketchum, Idaho- a fly fisherman's dream! Walk to Town, Fly Fish from the Back Yard! 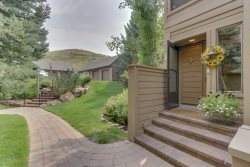 Located on the Big Wood River, Walking distance to Downtown Ketchum, and only 1.5 miles from the River Run Lifts, this stunning 4,200+ SF Luxury Townhome with (4) Bedroom Suites provides privacy for friends or extended families vacationing together. Fish the Big Wood from the Back Yard, Hike/Bike/XC-Ski/Snow Shoe on the Wood River Trail System (outside the front of the property) or take the Free Shuttle or Drive to the Ski Lifts- only 1.5 miles from the home. LIVING AREA: The living area features breathtaking Big Wood River views and natural light courtesy of the Floor to Ceiling Windows along the west wall. Relax in front the dramatic River Rock Gas Fireplace, watch the game on the Flat Screen TV, or enjoy the river views from the L-shaped Couch or Oversized Chairs. GOURMET KITCHEN: The chef of the group will enjoy the Fully Equipped gourmet kitchen with top of the line appliances including a Double Oven, 6-Burner Gas Cooktop, and Granite Counters throughout. The Wrap-Around Granite Counter with Bar Seating for four, is a great spot to enjoy appetizers or casual meal. DINING AREA: The formal dining seats 8, with gorgeous views of the Big Wood River and access to the FURNISHED PATIO with Gas Grill. Additionally, there is a POWDER ROOM adjacent to the GREAT ROOM, and conveniences such as Free WiFi, Full size W/D, and a 2-car Heated Garage.